Hosting a great cocktail party rarely happens by accident. As we head into the holiday season – when people’s schedules quickly fill with dinner parties, celebrations and family gatherings – a little bit of planning goes a long way toward throwing a throw-down your guests will remember. 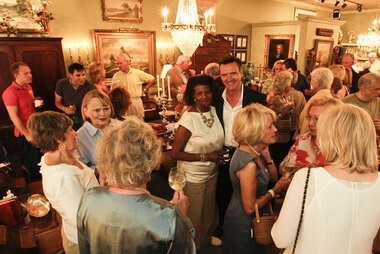 Decide on the number of guests at least three to four weeks before the party. Two weeks prior to the party, send out the invitations. If the invitation is a repeat, or you are working from addresses on file, make sure you update the list to accommodate weddings, separations/divorces, and deaths. Decide on drink ideas well in advance of the cocktail party. A full cocktail bar is actually less expensive than serving beer and wine. Theme drinks can be tricky and usually end up sitting on a table. One to three selections of wine are enough, e.g., one or two whites, one red. Plan on one bartender per 80 guests. Bartenders should be scheduled to arrive one hour prior to the event to assist set up. If you need to order flower arrangements from a florist, discussions and orders should take place two to four weeks in advance. Finalize numbers of the party one week before the event. Make sure you purchase all the cocktail bar condiments a few days early, such as tonic, club soda, ginger ale, Coke, Diet Coke, 7Up or Sprite, cranberry juice, lemons, limes and cocktail napkins. Make plans to secure ice and containers and include one trash can per bar, with liners. Prepare the menu one week in advance. As with the drink ingredients, be sure you can get all the ingredients prior to the event. Cocktail party food should be pick up only; no plates or forks should be needed. The pick-up pieces should be no larger than two bites. When presenting food such as a cheese mouse, guests should be able to spread it on small crackers or pieces of bread. Organize the layout of your location about three days prior to the event. Decorations should be on hand a few days in advance as well. One or two tables work better for food instead on having it scattered about the room – your guests may not actually see the food if it is placed in multiple areas. Depending on the number of guests, furniture or household items may need to be moved to storage to provide enough space to move about the event. Purchase ingredients for the food and drinks. Prepare food items the day before or the morning before, as befits the recipes and keeping properties of the food. touches like fresh flowers, bowls of fruit and disposable hand towels in the restrooms. Do not forget to have designed wait staff to bus tables and collect soiled glasses and plates. It works best to have a designated area for guests to deposit these items, such as a table or tray on stand. As host, make sure you allow enough time to freshen up and dress prior to the first guest arriving. The host or hostess should be near the entry to greet your guests as they arrive. Do not keep them waiting while you are dressing or attending to last minute details. Hiring an experienced person to oversee the last minute set ups and monitoring food trays makes the event run smoother. Add small touches like fresh flowers, bowls of fruit and disposable hand towels in the restroom.